Tuberculosis is an ancient disease, but it poses a modern public health emergency in Papua New Guinea, writes Médecins Sans Frontières Australia President Dr Stewart Condon. Tuberculosis (TB) has been infecting humans for thousands of years, but it’s a disease that we’ve never managed to overcome: worldwide, TB kills more people than any other infectious disease. One of the countries most affected is Australia’s closest neighbour, Papua New Guinea (PNG). TB is a huge public health burden in PNG, with almost 30,000 new cases in 2016. The high prevalence of TB and the increase in drug-resistant cases led the government to declare a state of emergency in three provinces of PNG in 2014. Médecins Sans Frontières is providing TB diagnosis and treatment in two of these provinces – Gulf Province and the National Capital District. I visited our TB programs in PNG, and was struck by the huge challenge of managing a disease as complex as TB in a place as inaccessible and under-resourced as PNG. In Gulf Province, our teams are based in Kerema – a town seven hours’ drive from the capital, Port Moresby, and literally at the end of the road. Further west, there are no roads and extremely limited access to healthcare and other services. Patients told me of travelling for hours or even days to reach our clinics, using a combination of dinghies, cars and walking. Transport can also be prohibitively expensive – $40 or $50 for a few hours in a dinghy. It’s not only the extreme geography that is challenging. In the remote villages around Kerema, access to education is limited and the low health literacy of some of our patients means they don’t understand how to limit the spread of TB. Moreover many people across the country still believe TB is the result of sorcery. "For patients with drug-resistant TB, treatment takes up to two years including daily injections in the early stages, and often has serious side effects such as ongoing nausea or even deafness"
These geographical and cultural barriers contribute to one of our biggest challenges – ensuring that patients adhere to TB treatment. TB is not a simple chest infection. It’s an insidious infection with very hard-to-kill bacteria. Successfully treating TB is gruelling, taking at least six months using a combination of various antibiotics. For patients with drug-resistant TB, treatment takes up to two years including daily injections in the early stages, and often has serious side effects such as ongoing nausea or even deafness. 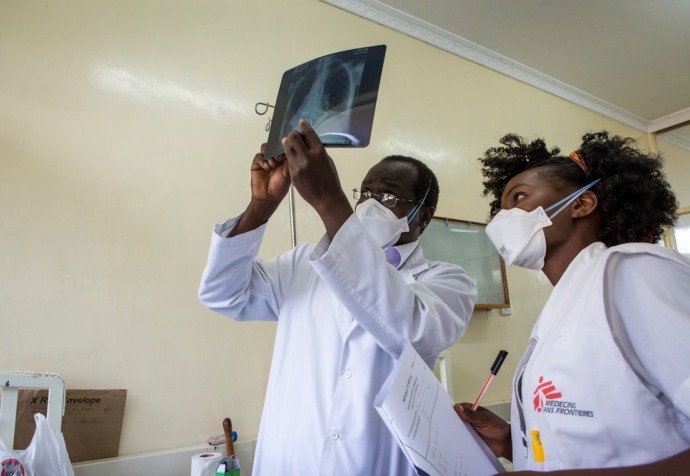 It is critical for patients to stick to TB treatment not only to cure their individual disease, but also to reduce the risk of infecting others, and to ensure that their infection doesn’t become resistant to the drugs. In PNG I met patients who had converted from drug-sensitive to drug-resistant TB because they had not been able to keep taking their medications. If this happens on a larger scale, it’s a potential disaster that is much harder to manage. While patients defaulting on their treatment is a huge problem for our teams, we are working hard to increase adherence. All patients are provided with counselling and education to improve their understanding of the disease and to ensure they’re followed up appropriately. On the other hand, we are also trying to improve our understanding of our patients and the local culture, including by working with an anthropologist. Importantly, we have decentralised our care to bring treatment closer to patients. In Gulf Province, I travelled with the team to one of our monthly TB clinics in the remote village of Kukipi – a journey of more than two hours from Kerema by boat and road. The clinic is one of many we run in small villages, allowing people to receive medication and diagnosis closer to home. We also provide transport to help patients reach care, as well as supporting a network of Community Health Workers and Treatment Supporters who visit patients at home, sometimes daily. In Port Moresby I accompanied our outreach team providing home visits for patients with difficulties accessing their clinic or adhering to treatment. It’s extremely labour and time-intensive, but it reflects that we are doing everything to reduce the number of patients ‘lost to follow up’. TB management has changed so much in recent years, especially for drug-resistant TB. My first assignment with Médecins Sans Frontières was also on a TB project, in Bentiu, in what is now South Sudan. Back then in 2004, we had to wait weeks to confirm if a patient’s TB infection was resistant to the most commonly used drugs. In PNG we now use the GeneXpert machine, which tells us within hours if the infection is drug-resistant. This has revolutionised TB management because it means patients can start on the appropriate medication immediately. There are also new drugs for drug-resistant TB, which are starting to be used in PNG, but need to be more widely rolled out, including in our projects. The Australian Government invests considerable funds in responding to TB in PNG, under the banner of “health securitisation”: an attempt to protect Australia from the high rates of TB across the Torres Strait. While this is certainly important, the motivation for Médecins Sans Frontières has and always will be the value of healthcare itself. People in PNG need access to medical care for serious conditions like TB, just like our patients anywhere, and we will continue to adapt our approaches to reach them as best we can.